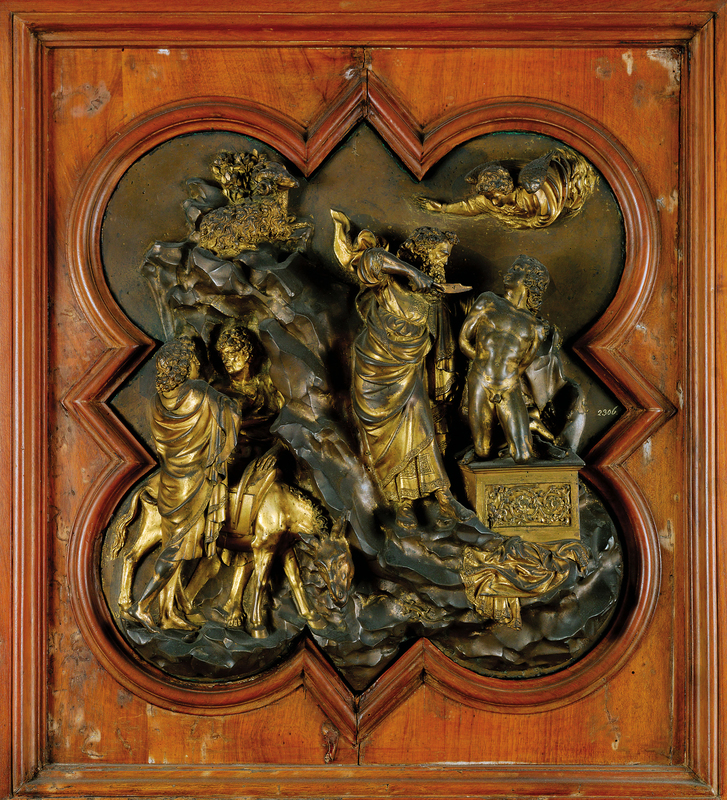 Slides of Brunelleschi and Ghiberti panels for the "Gates of Paradise." 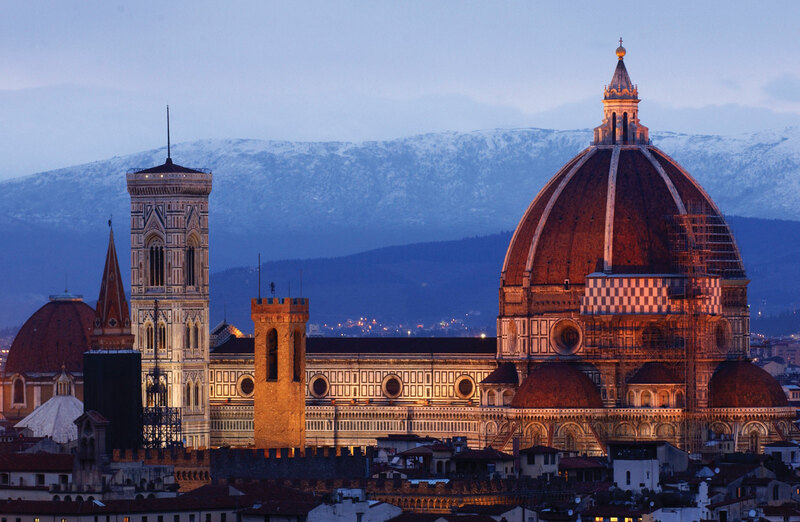 Book: Brunelleschi's Dome: How a Renaissance Genius Reinvented Architecture - Filippo Brunelleschi's design for the dome of the cathedral of Santa Maria del Fiore in Florence remains one of the most towering achievements of Renaissance architecture. The dome remains a remarkable feat of design and engineering. Its span of more than 140 feet exceeds St Paul's in London and St Peter's in Rome, and even outdoes the Capitol in Washington, D.C., making it the largest dome ever constructed using bricks and mortar. The story of its creation and its brilliant but "hot-tempered" creator is told in Ross King's delightful Brunelleschi's Dome. Explain that Filippo Brunelleschi was one of the most famous architects of the Renaissance period (1377-1446). Filippo was also a sculptor and a friend of Donatello. 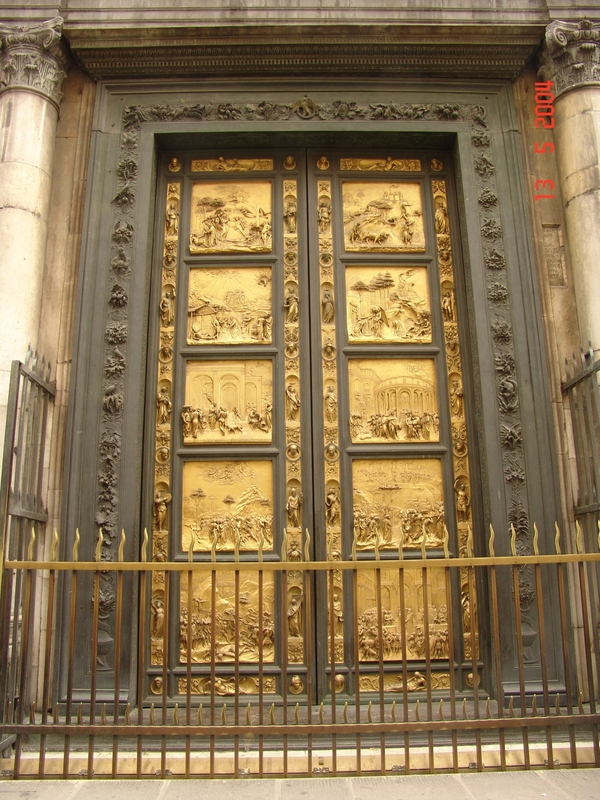 Filippo entered a contest to design gold doors for the Baptistery in Florence. (Show slides of competing panels from Brunelleschi and Ghiberti.) When he lost to Ghiberti, he gave up sculpting. He was a poor looser, but because of this, he began focusing on architecture. 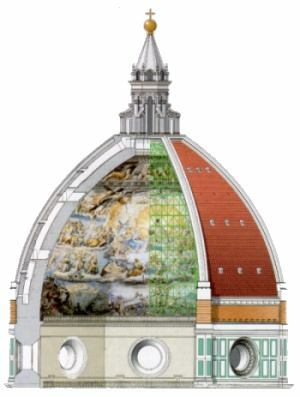 The most famous building he designed was the dome for the Cathedral in Florence. He told everyone they needed to make the dome higher than they were planning. He also had a plan to make the dome without an armature (Support). We are going to make the dome that Filippo designed today. Pass out xeroxes of the dome design for the Cathedral Dome in Florence, Italy. Students will then group into 1 or 2 (if numbers allow) groups of 16 students. 8 students will stand in a circle and join their raised hands at the top. This will form a human version of the drum, the supporting structure for the dome. 8 more students will encircle these students and will arch their arms over to the top of the hands of the other students in the center. (see illustration below) Once students are in place, the teacher will place the lantern (a simple cone may be used) on top of the center of the group. Explain that this is how Filippo designed the first dome ever designed without extra supports. Ask: How many students in here have ever been jealous or wished that they drew as good as another student? (Call on individuals who raised their hand) When did this happen? What do I tell students who say they can't draw or aren't as good as other students? Why do you think they are so hard on themselves? Explain that Donatello and Brunelleschi were good friends as well as artists and became jealous of each other one day. Ask for everyone to stand up and to pick one partner. They will move in place, so they can stand next to their seat. Have them choose which character they want to be. Tell them to listen carefully and to act out what I read without speaking the first time. Body language should be exaggerated. Explain that it's important to show anger and jealousy when they act out their parts. Read the following: "One day, long ago, Donatello was busy carving a sculpture in his studio. He was so happy with his sculpture of Jesus because it was looking good and was going in a very important church, Santa Croce. He was proud of his sculpture. When he carved his last piece from the wood, he let out a sigh and stood back and looked at his sculpture with a smile. "I must let Filippo see my sculpture," Donatello thought. Filippo came to visit Donatello one day. Filippo walked up to the sculpture and began staring at it. He was jealous because it looked so good. When Donatello asked what he thought, he yelled, "your Jesus looks like a poor man and not that good!" Donatello became very angry by what Filippo said. He said, "If you think it's so easy, then you do one yourself!" Filippo grinned and yelled, "OK, I will!" He then left." Review the scene with the students and then have students switch positions and do the scene over again, this time with them speaking and using their own words. Pick two students during this time who spoke quite well and ask everyone else to sit down to watch. Ask these two students to choose who will be each character. Tell them to mime the following story. Again, body language is important. Read the following: "Filippo began busy carving his own sculpture of Jesus out of wood. He hammered the chisel over and over again. When Filippo was finished he stood back from the sculpture and looked at it. He thought, "It's much better than Donatello's. Just wait until he sees this!" Filippo came up with a plan to show the sculpture to Donatello. He walked down the street to Donatello's studio. Donatello was busy carving another sculpture when he came in. Filippo said, "come with me to my house and have dinner with me." Even though Donatello was still mad, he said OK. Filippo handed him some eggs and said to go on ahead without him because he had to get some fruit for the meal. Donatello went on ahead and went in Filippo's house. There on the wall was the sculpture of Jesus called the Crocefisso that Filippo carved. He froze and dropped all the eggs he was carrying. His mouth opened with amazement. It was the most beautiful thing he had ever seen. In his heart he knew that it was better than his sculpture. At first he wanted to lie and say it was awful because he was angry. Instead, he thought how important a friend Filippo was to him. When Filippo came in, Donatello said, 'from now on, you will carve all the Jesuses and I'll carve all the poor people.' Both of them laughed and sat down for dinner." Have the two students switch positions and do the scene over without my narration and them speaking, then have them sit down and ask: What are some lessons we can learn from Donatello and Filippo today? Do you know anyone in this classroom today that is angry or jealous with someone? Close with comments on the fact that both were able to get past their anger and jealousy, make-up and remain friends. This lesson is appropriate for 3-5th grades only. Explain: Architects of the Renaissance used what is called the Divine Proportion to design buildings. They used fractions in art. Most of you have a hard time with fractions and some of you may not even have studied fractions yet. Don't worry, we'll learn that art can make fractions easy. The numbers used in their fractions had to do with the leader of Christians, Jesus Christ. Religion was very important to Italians then. The reason they used the number 5 is because Jesus had 5 wounds and cuts on his body when he was nailed to a cross. The reason they use the number 3 is because Christians believe that God is 3 people, the Father, Son, and Holy Spirit. The Son, who is Jesus, is number 2 and 2 times 5 equals 10, the number of the 10 commandments. Artists used the number 7 in their designs because Christians believe that God took 7 days to make everything. The number 12 was used because it was the number of Jesus' disciples. Now let's have some volunteers. Have two groups of 5 students stand before the class. (The remaining students may remain in their seats) If you have 5 of anything, you can have fractions in fifths. One student is one fifth, two students are two fifths, and so on. To test everyone on fractions, I'm going to turn on some music. When the music plays, the 5 students will stand and squat to the beats of the song. I don't want you to be all together, however. When I stop the music, you will freeze. We will then count the students standing up and we'll see who can tell us the fraction. (2 students standing means 2/5's) Repeat this process 3-4 times. Have two groups of 3 students stand before the class. Repeat #2 using thirds as the fractions. History of Italian Renaissance Art - If there was one book on Italian Renaissance art, this would be it. I first got this book while studying in Italy and it is filled with color photos and detailed information. I highly recommend this book! The Architecture of the Italian Renaissance - A handsome reissue of a classic guide to the architecture of Renaissance Italy indispensable to travelers, students, and architecture buffs alike and still the most comprehensive and accessible overview available. Photos and drawings throughout. The volunteers will sit down and 5 tangrams of one color and 3 tangrams of another color are passed out at each table. Pass out xeroxes of the Pazzi Chapel wall (You can also use this image). Have students trace the contour of a wall and illustrate the proportion. Refer to this tutorial [Archive]for assistance. Play with the tangrams on your table to see how you can create the same wall using these blocks. Place your blocks on the xerox to see that the Pazzi chapel wall is a fraction of fifths. Now draw your own wall using fractions of thirds and fifths. You may use Rulers to make straight lines.